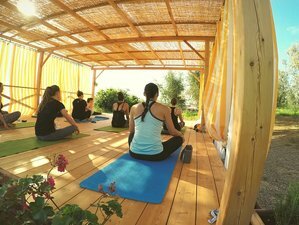 Expert tip: This is one of the most popular yoga retreats offered in Italy. Tuscan Fitness invites you to a health holiday in the middle of the tranquil Tuscan countryside. Relax and recharge with a mix of yoga, fitness sessions, delicious food and relaxation surrounded by nature. The setting is cozy and warm, reflecting the nurturing environment that will host you on your getaway. It is a place where you are welcome to take what you need from the program to feel rejuvenated and refreshed. Throughout their stay, Tuscan Fitness guests will be hosted at the charming La Forra Hotel in the heart of the Tuscan countryside. The hotel is both spacious and accommodating, combining incredible views with typically Tuscan architecture and atmosphere. Located on the doorstep of the famous Chianti region, the hotel is situated on a hilltop overlooking the Valdarno valley and is complete with amazing views in all directions across rolling green hills, beautiful historic towns and unspoiled forest. Each day features daily intermediate or beginner yoga sessions as well as fitness classes (HIIT, Barrè, Pilates) and also daily guided hikes across the beautiful Tuscan countryside. You will have the freedom to choose which fitness activities to partake in with experienced personal trainers and yoga instructors. Tuscan Fitness wants to give you the chance to get away and rejuvenate and restore your body in whichever way you need to. They understand that each person has different desires and needs and they are willing to accommodate you. Of course if you wish to follow the general itinerary, a typical day includes yoga sessions, breakfast, a tranquil walk, and two to three other opportunities for exercise of your choice. The beauty of Tuscan Fitness is that you can take as much or as little from exploring other activities that they offer and if you like you can even opt to simply rest and relax. Alix is a personal trainer and an accredited Ashtanga and Vinyasa yoga instructor. Based in Italy, she knows the area and often leads hiking tours and organizes new menus for clients at Tuscan Fitness. For Alix, nutrition and a healthy lifestyle has always been of paramount importance. She is a strong supporter of the Latin saying 'mens sana in corpore sano', which means that only a healthy body can support a healthy mind, so you should strive to keep your bodies in top condition. This was the genesis which led to the development of the Body and Mind company. Francesca is a personal trainer and a sports massage therapist from London with a wealth of experience and an array of knowledge. She has 12 years of experience working in the fitness industry at some of London's leading health clubs. Fran holds a degree in sport and exercise science. She was also trained in boxing by David Haye on his training course. A certified Master Kettlebell instructor, she is taught personally and certified by Europe's leading kettle bell instructor and TVs former Biggest Loser trainer, the late Angie Dowds. Tuscan Fitness is hosted in the heart of the tranquil Tuscan countryside, outside a town called Cavriglia at the hotel La Forra. Located just in the Upper Valdarno, it is often considered the center of the triangle that joins the cities of Florence, Arezzo, and Siena, making it ideally convenient for visiting the area. Nestled between the left bank of the river Arno and the hills of Chianti, it is also called the Porta del Chianti, which means the door of Chianti, as it is situated on the doorstep of this beautiful region, famous worldwide for its delicious wines. The location of the hotel is a region known as a gorgeous area that is peaceful and quiet, complete with historic hilltop towns and rolling green hills. The area around the hotel is typically Tuscan, with views across the horizon of farms, cypresses, olive groves, and vineyards that extends as far as the eye can see. At Tuscan Fitness, the aim is to provide a well-rounded menu that is nutritionally balanced, wholesome, and delicious also. Combining a healthy, nutritious diet with the pleasures of Italian cuisine, all our meals are prepared in the hotel kitchen, with your dietary preferences and allergies in mind to give you the best culinary experience possible. Tuscan Fitness strives to source as much food locally as possible, thus not only getting the freshest food, but also lowering the carbon footprint in the process. Our chef and staff will strive to provide creative options to satisfy both your nutritional needs and taste buds. We use locally sourced products to ensure the utmost quality and taste of our ingredients. At Tuscan Fitness, you are encouraged to do whatever you need to in order to have the health holiday that you need, one that will make you feel stronger and happier. Life is too fast-paced and does not provide enough respite for ones health, and so, coming to Tuscan Fitness gives you a chance to get away and repair whatever is broken. Whether you need sleep, exercise, or a lot of amazing Tuscan wine. Take the A1 autostrada for 48 kilometers to the direction of Rome and the exit is Valdarno. Once off the autostrada, you go right towards Montevarchi. At the roundabout, take the 408 entering the underpass for Cavriglia and after about seven kilometers, turn left for Montegonzi. After about three kilometers, you will see the directions for Agri-Resort La Forra. Take the autostrada A1 for two hours to the direction of Florence and the exit is Valdarno. Please book your flight to arrive at Peretola Airport (FLR), Fiumicino-Leonardo da Vinci International Airport (FCO), Ciampino-G. B. Pastine International Airport (CIA), Pisa International Airport (PSA), or Siena-Ampugnano Airport (SAY). Transfer from and to these airports is available upon request. Tuscan Fitness Ltd can organize a shuttle pick-up for you upon your arrival at the airport (cost between 150 EUR - 400 EUR). You can get a direct train from Florence which will take about 35 to 45 minutes to Montevarchi-Terranuova. From Rome, the train takes between one and a half to three hours, depending on the train you decide to take. From Pisa or Bologna, the time varies but it is generally between one to two hours. For clients traveling to Tuscan Fitness by train, they have set pick-ups at midday at 3 p.m. and 6 p.m.. For departures from the hotel to the station, the set times are 9 a.m., 11:30 a.m., and 2:30 p.m..
Airport: Siena–Ampugnano Airport Airport transfer available: Siena–Ampugnano Airport (US$168 per person) Additional charges may apply. You can request this in the next step. Airport: Ciampino–G. B. Pastine International Airport Airport transfer available: Ciampino–G. B. Pastine International Airport (US$448 per person) Additional charges may apply. You can request this in the next step. Airport: Leonardo da Vinci–Fiumicino Airport Airport transfer available: Leonardo da Vinci–Fiumicino Airport (US$448 per person) Additional charges may apply. You can request this in the next step. Airport: Pisa International Airport Airport transfer available: Pisa International Airport (US$224 per person) Additional charges may apply. You can request this in the next step. Airport: Florence Airport, Peretola (Amerigo Vespucci Airport) Airport transfer available: Florence Airport, Peretola (Amerigo Vespucci Airport) (US$168 per person) Additional charges may apply. You can request this in the next step. Tuscan Fitness offers unique health holidays in Italy combining yoga & fitness with a relaxing getaway. Select your own dates & create your own experience.